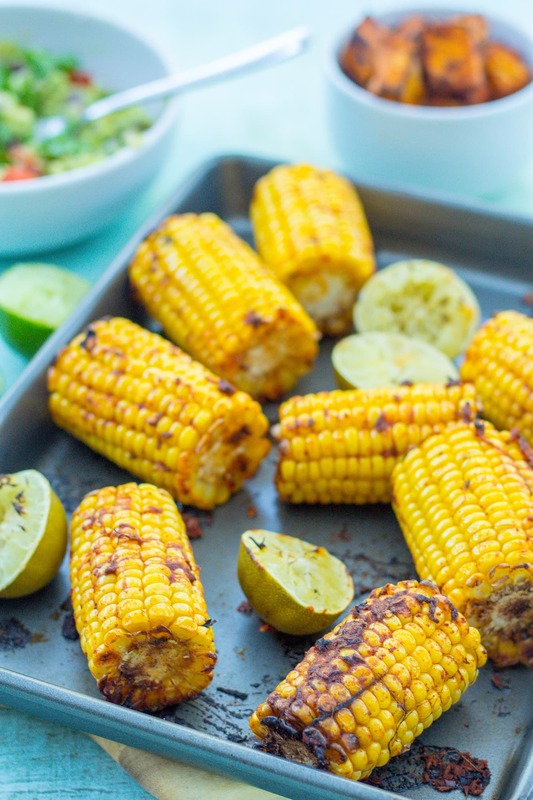 Quick, healthy and delicious, this Easy Roasted Mexican Corn on the Cob is a real crowd pleaser! Serve as a side with all your Mexican favourites. 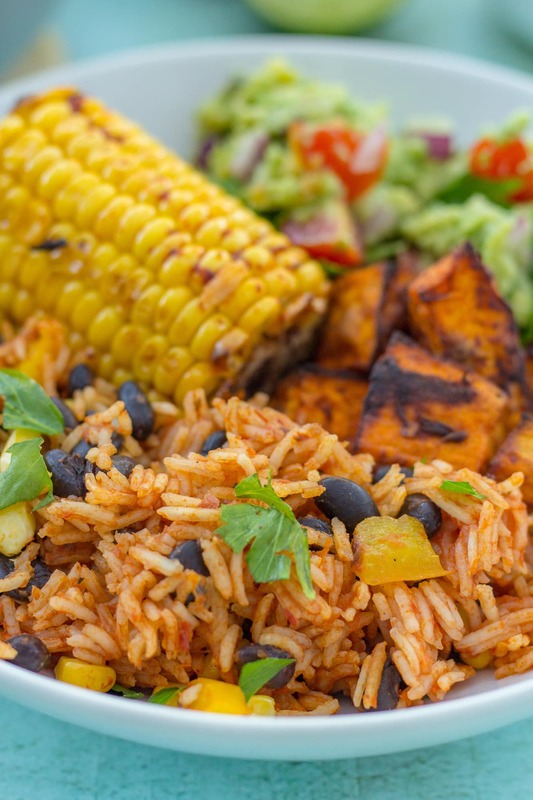 A few weeks ago, I shared with you my Easy Mexican Rice recipe – a delicious mix of rice, corn, black beans, peppers and Mexican spices. I served my Mexican rice with a couple of Easy Peasy Foodie favourites: my Chunky Guacamole and my Mexican Roasted Sweet Potato Cubes, as well as a new entrant to the Easy Peasy Foodie repertoire: this delicious Easy Roasted Mexican Corn on the Cob! It’s a very simple recipe. Just mix together chilli flakes, spices, lime juice and a little olive oil and roast in the oven for 15-20 minutes until done to your liking. Alternatively you can grill these on the barbecue (when it’s barbecue weather!!). You can eat this Easy Roasted Mexican Corn on the Cob hot or cold, either on the cob or cut off and mixed into other dishes. Whichever way you do it, it’s bound to be popular! My family couldn’t get enough. 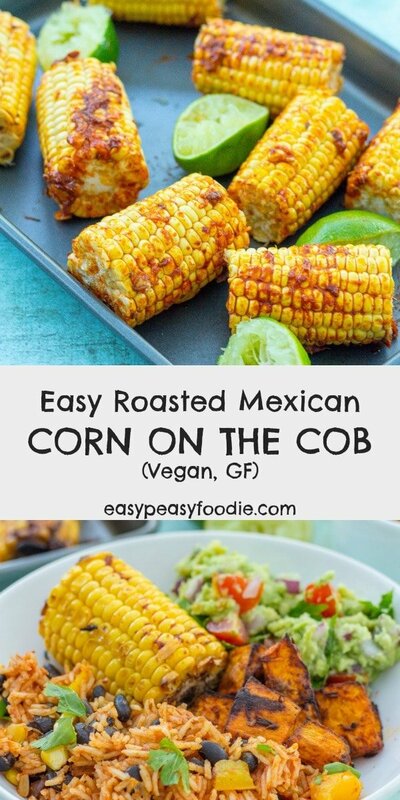 My Easy Roasted Mexican Corn on the Cobs would go brilliantly with any of my easy Mexican recipes. But if I was going to select a couple of my favourites I’d go for my Easy Chicken Mole or my Mexican Chicken Traybake. If you prefer a plant-based main, go for my Vegetable Mole or my Vegetable Fajitas. And just for info – the spice mix is exactly the same as the spice mix for my Mexican Roasted Sweet Potato Cubes, so why not save time and do a double quantity of the spice mix and make both of these delicious Mexican sides?!! Mix together the cumin, paprika, chilli, salt, garlic, olive oil and lime juice in a large bowl. Place the sweet potato cubes on a large non-stick baking tray, ensuring the corn on the cobs are well spread out and in a single layer. It’s crucial to ensure the cobs are spread out well over the baking sheet - if they are touching each other too much or piled on top of each other they will steam rather than roast! I have found that if you use a good non-stick baking sheet, the cobs don’t need turning throughout their cooking time, but if you are at all worried do give them a check after 10 minutes and turn them if you think necessary. I am sharing this recipe with Cook Blog Share, Cook Once Eat Twice, and Recipe of the Week. Ooh, I love Mexican street corn! Your version is so simple and gorgeous: I can’t wait to try it. You can’t go wrong with this spice mix—and, of course, the garlic! YUM. 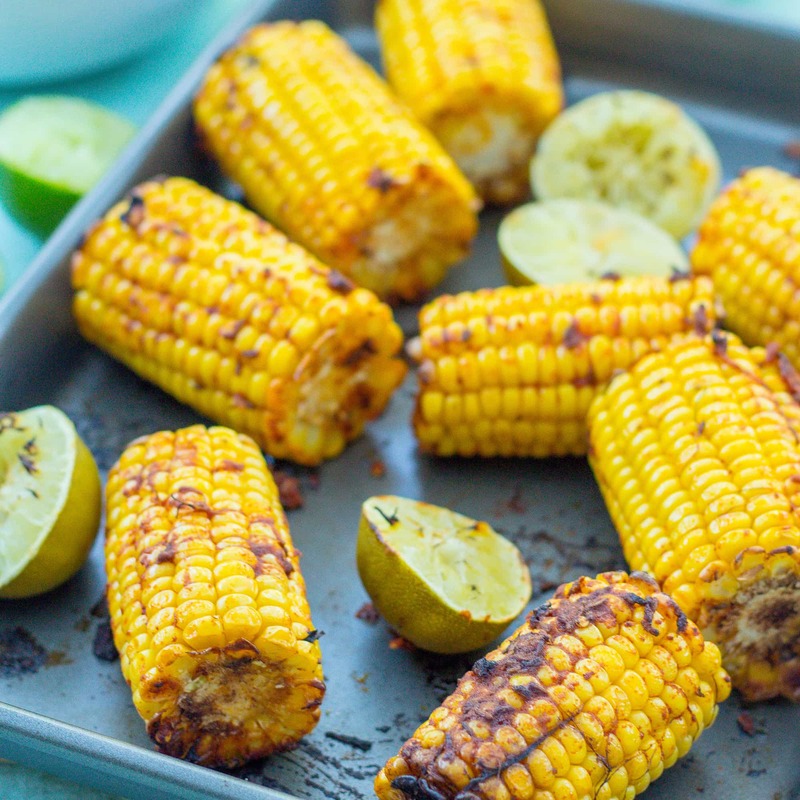 I just love corn on the cob with lime and spice. 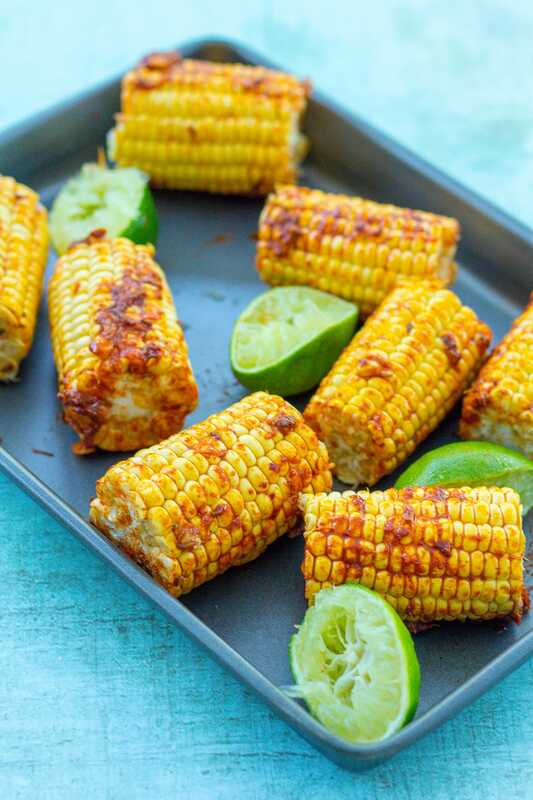 I love sweetcorn with Mexican flavours and this looks absolutely delicious! 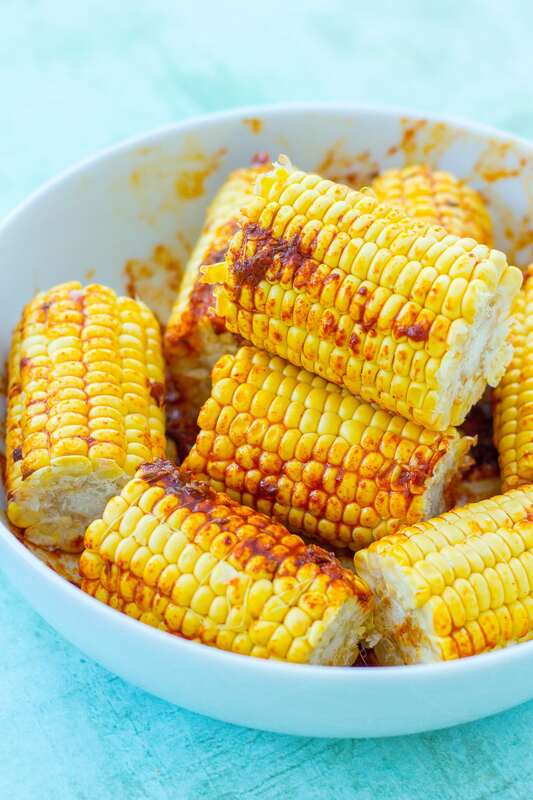 Absolutely love roasted corn. Great recipe! !